Unicaja Malaga held on for its first win of the Turkish Airlines Euroleague season by edging Asseco Prokom Gdynia 75-77 on the road Wednesday in Group B. The visitors led throughout most of the game, but Prokom took the lead with three-and-a-half minutes to go. Txemi Urtasun put Unicaja back ahead, 72-73, with a clutch three-pointer and free throws by Earl Calloway iced the victory. Marcus Williams shined with 18 points and 4 assists for Coach Jasmin Repasa’s team. 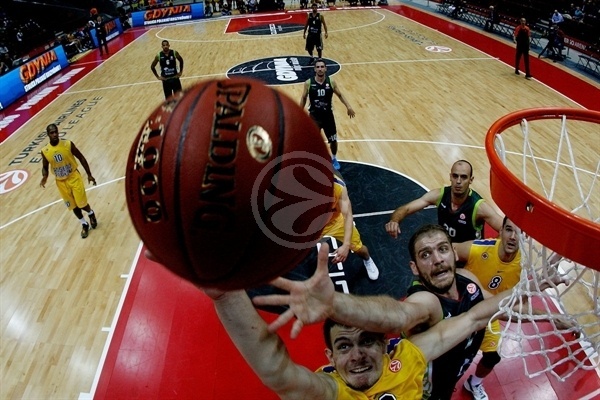 Txemi Urtasun added 14 points, Zoran Dragic scored 10 and Luka Zoric played a key defensive role with 5 blocks in just 20 minutes – 1 rejection short of the club’s Euroleague record. Lukasz Koszarek impressed with 16 points and 8 assists for the Polish champs, Frank Robinson scored 14 and Adam Hrycaniuk, who played a big part in Prokom’s fourth-quarter surge, scored 11 and grabbed 7 rebounds before fouling out. Robinson plowed through the paint for the game’s first points before James Gist got Unicaja on the scoreboard from the line. Gist added a turnaround jumper before Earl Calloway pulled up for a triple that gave the visitors their first lead, 4-7. Rookie Mateusz Ponitka hit a big triple and Robinson followed with another as Prokom jumped ahead 12-9. Urtasun beat the entire Prokom defense back for an uncontested layup as the lead continued to change hands. Robinson added points from the charity stripe. Unicaja brought Dragic in and he delivered immediately with a pair of layups for a 14-17 edge. Dragic’s cross-court pass to Urtasun allowed the latter to stretch lead with a three-pointer and Dragic made it 16-22 with a pair of free throws. 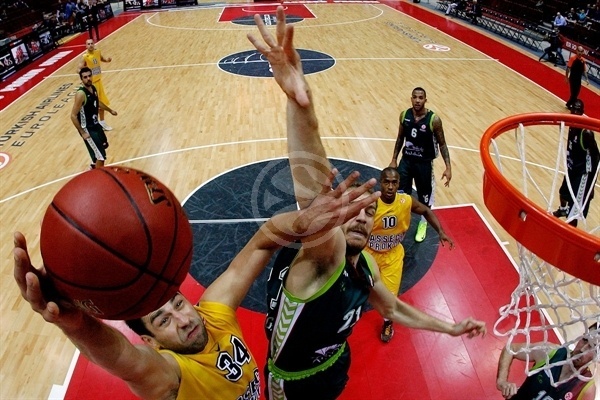 Rasid Mahalbasic scored his first Euroleague point from the line, but Urtasun buried another three at the other end. Jerel Blassingame fed Robinson for a viscous alley-oop slam and Alex Acker netted his first Prokom points from behind the arc to close the gap to 3, but Williams beat the buzzer from downtown to make it 22-28 through 10 minutes. Robinson reached double figures in points with free throws early in the second quarter. 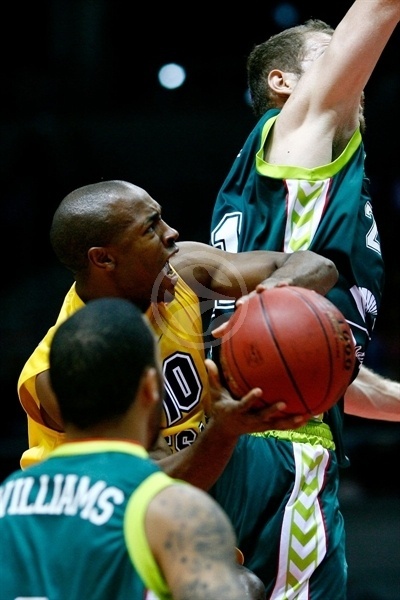 Williams further boosted Unicaja’s lead with a three-pointer-and-foul to give Unicaja a 10-point lead. Carlos Jimenez added another three for his first points of the season to cap a run of 9 unanswered points. Koszarek tried to ignite the hosts with a basket and Hrycaniuk added 2 from the line, but a Zoric jumper kept Unicaja in control. Robert Witka connected with a three from the top of the arc to make it 31-41. After a timeout, Koszarek added another triple. Urtasun scored from the line, but Koszarek free throws made it a 6-point game. Williams hit back with a three-pointer, but Blassingame flipped to Mahalbasic, whose layup made it 39-45 at the break. Witka’s second three of the night brought the Polish champs within 3, but Calloway connected from behind the arc for Unicaja on the next possession. Prokom kept pushing and after Mahalbasic scored inside and Witka made another triple, it was 47-48. Unicaja’s top scorers from the first half, Urtasun and Williams, put Unicaja back up by 5 before Koszarek answered. A Blasingame triple brought the hosts within 52-54 midway through the third quarter. After Gist made 1 free throw, Blasingame drove to make it a 1-point game again. 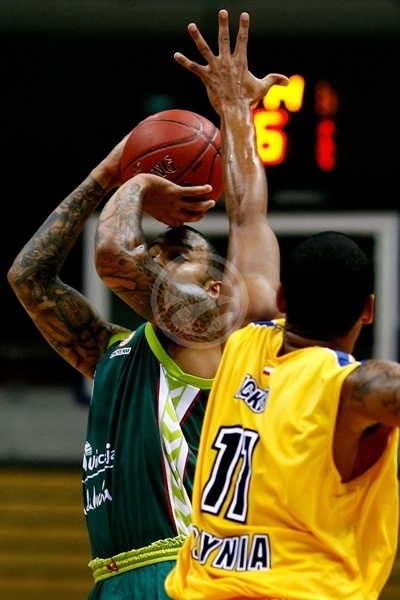 Williams fed Fran Vazquez for an impressive two-handed jam and then sank a three to keep Unicaja rolling. Poniitka banged in a big three-pointer to keep the hosts within 2, but Krunoslav Simon raced downcourt and his layup beat the buzzer to make it 59-63 with one quarter to go. Robinson connected on a big three to the delight of the home supporters, but Williams took charge for Unicaja with a three of his own. 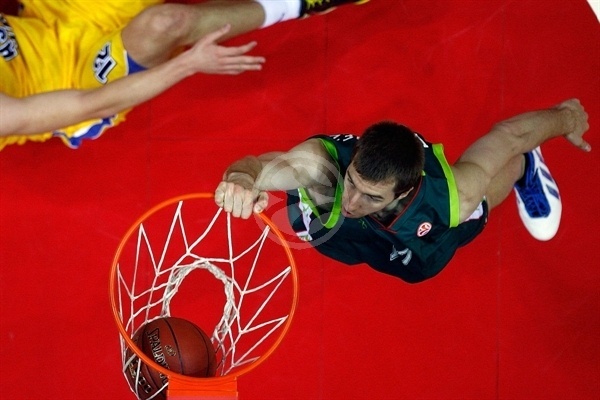 Dragic added to the Unicaja lead with a powerful slam. With the game on the line, both teams went cold as nearly three minutes passed without a point scored. 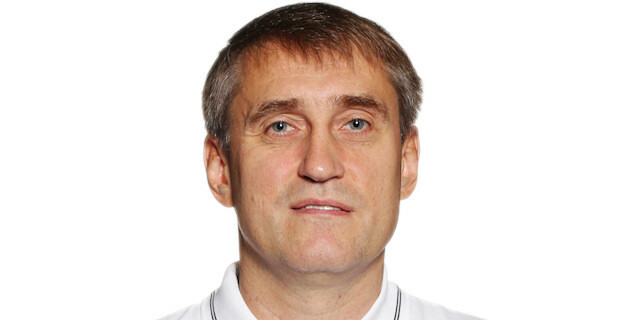 Koszarek gave the fans something to cheer about with a triple and then – following a timeout – Hrycaniuk came through with a tough basket-plus-foul to tie the score at 68-68 with just under four minutes to go. Blassingame found a cutting Hrycaniuk on the next play for Prokom’s first lead since the first quarter. Simon, however, scored at the other end, but Hrycaniuk remained a stud underneath with another basket. 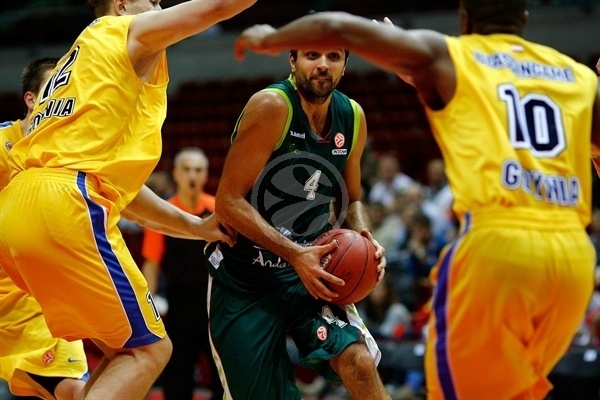 Malaga regained the lead at 72-73 with two minutes to go after Urtasun drilled a three. Hrycaniuk’s night ended with 92 seconds left after he committed his fifth foul. Gist then put the visitors up 3. Robinson and Blassingame missed chance to tie it with threes and Calloway extended the lead to 72-77 with free throws with 20.4 seconds remaining. Blassingame scored and drew a foul with 6 seconds left to make it a 2-point game. 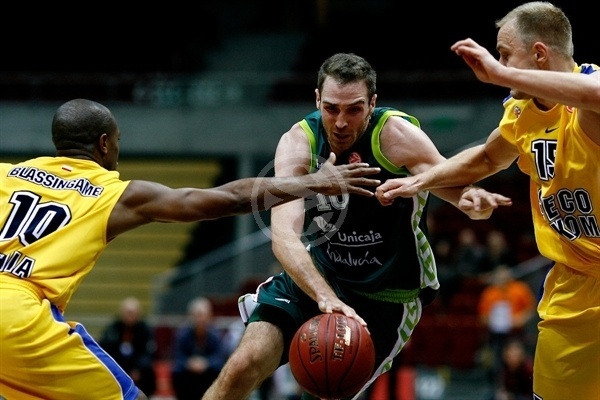 However Prokom was unable to foul on the last play and Unicaja ran out the clock to collect the road win. "That was a close game, a really close game and we had our chances. We can't win against such a great team like Malaga if we make 15 turnovers. Small details decided the final score like the defense against pick and rolls when Urtasun and Willams punished us few times. 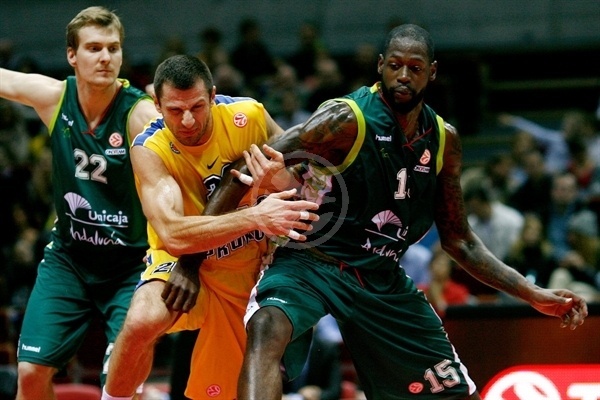 We had no big guys in the crucial moments and we did not have enough size under the basket. 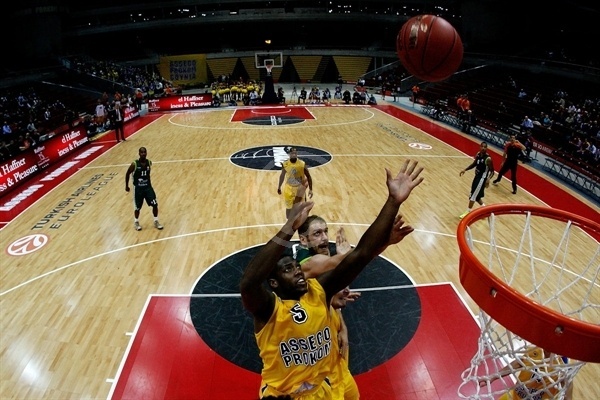 We won the third and fourth quarters, but today unfortunately, it was not enough." "We won the game, but in the locker room I said to my players that it wasn't a good game for us. 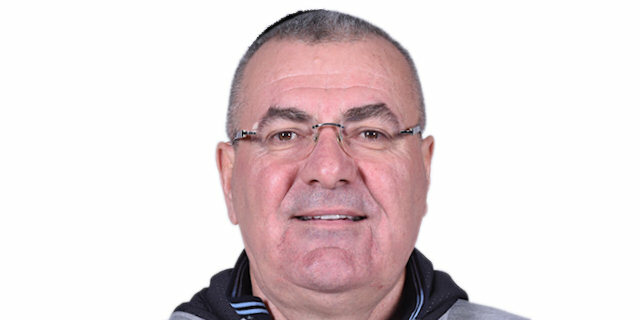 We still need some time to learn how to play together, because we have 10 new players and a new coach who spent a lot of time with his national team. I am happy that we won, but like I said, there is still a lot of work to do for us and I believe that we will play better week after week."